Pronouns Pronouns refer to nouns or noun phrases. We use them to avoid repetition. The machine is broken. It isn’t working properly. Jane is a clever. 9-Intensive pronouns:	itself, himself Cf. I told myself not to rush on the roads. I myself did all the work. 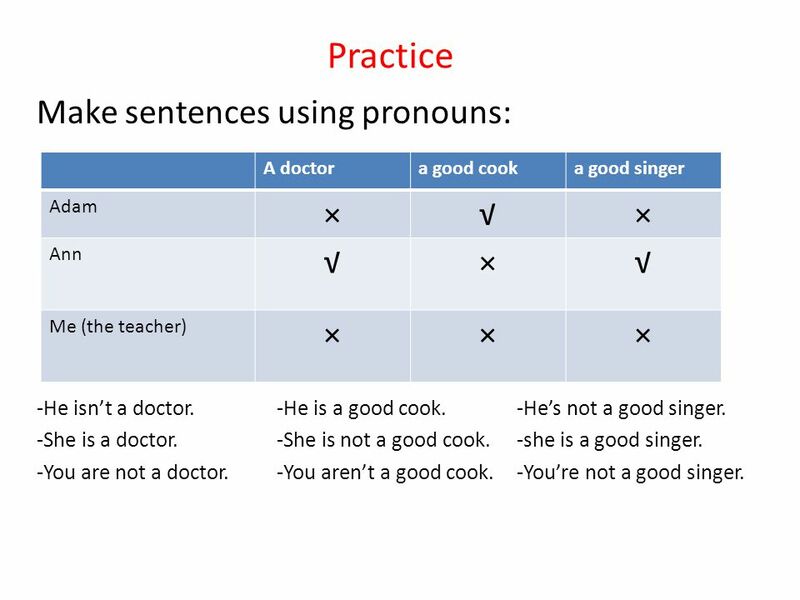 4 Subject pronouns When pronouns have the role of a subject, they function as subject pronouns. I woke up at about 6 am. We lived in the room above the shop. You may use a paper dictionary in the class. He/ she is a member of the team. They offered her a job. 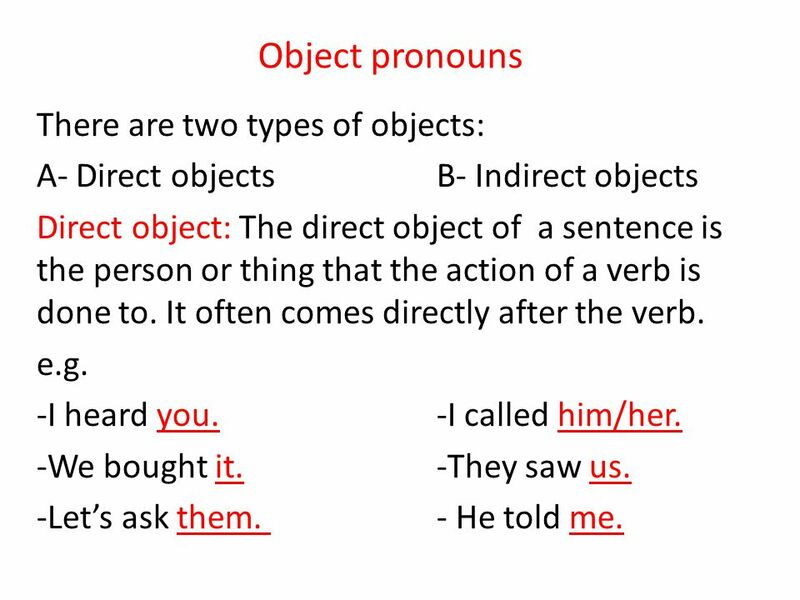 A- Direct objects	B- Indirect objects Direct object: The direct object of a sentence is the person or thing that the action of a verb is done to. It often comes directly after the verb. e.g. I heard you. -I called him/her. We bought it. -They saw us. Let’s ask them He told me. 6 -They threw it a biscuit. 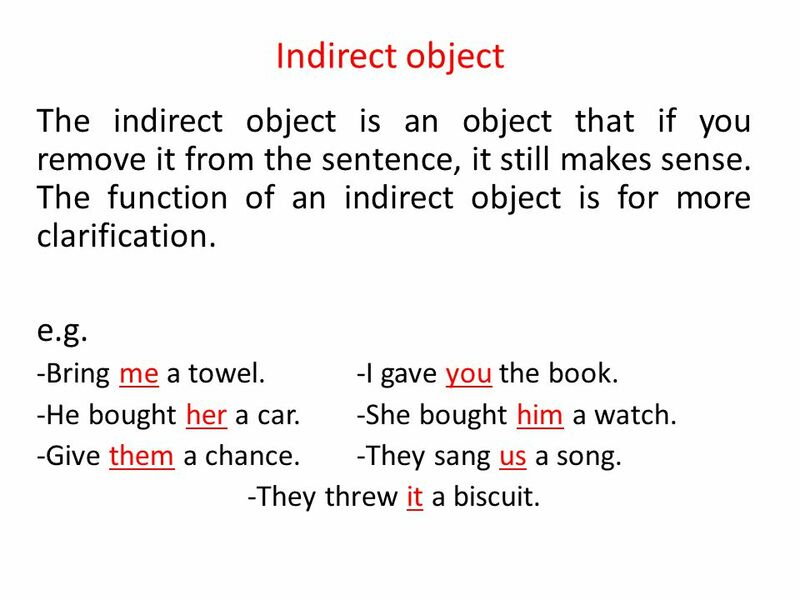 Indirect object The indirect object is an object that if you remove it from the sentence, it still makes sense. The function of an indirect object is for more clarification. e.g. -Bring me a towel. -I gave you the book. -He bought her a car. -She bought him a watch. -Give them a chance. -They sang us a song. -They threw it a biscuit. 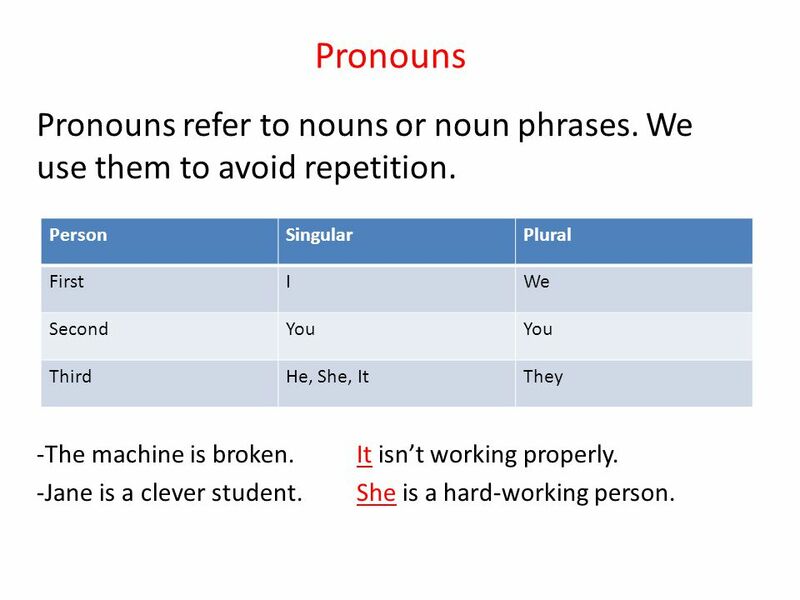 Download ppt "Pronouns Pronouns refer to nouns or noun phrases. We use them to avoid repetition. The machine is broken. It isn’t working properly. Jane is a clever." PRONOUNS Pronouns take the place of a noun or another pronoun. The words replaced are called ANTECEDENTS. Pronouns. Let’s Recap Pronoun Case 1.Subjective 2.Objective 3.Possessive. Pronouns A pronoun is a word that takes the place of a noun or pronoun. Your Name. SebaLuigi Production.  Pronouns are words that substitute for nouns. 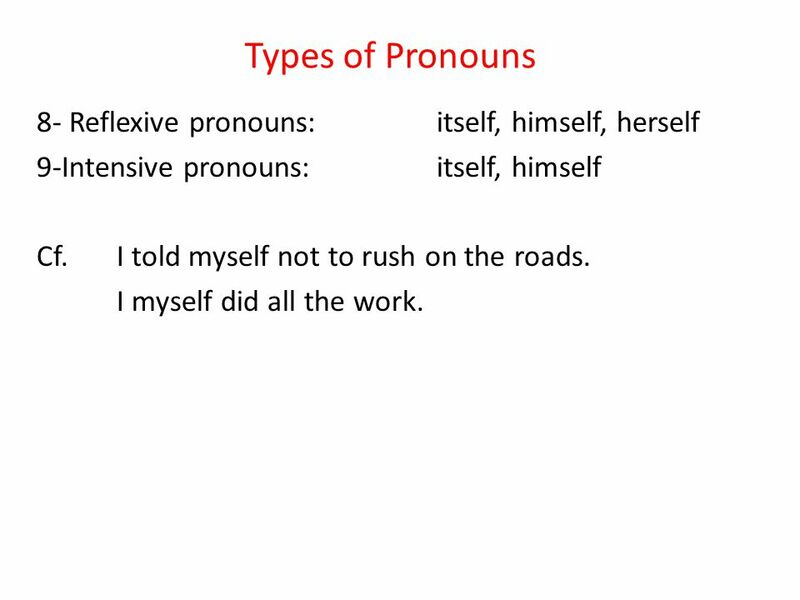 Pronouns The different types…. What are they? The term 'pronoun' covers many words, some of which do not fall easily under the pronoun category. There. Prepared by: Dipakbhai V. Parikh PRONOUNS Prepared by: Dipak. V. Parikh. Prepared by: Dipakbhai V. Parikh. 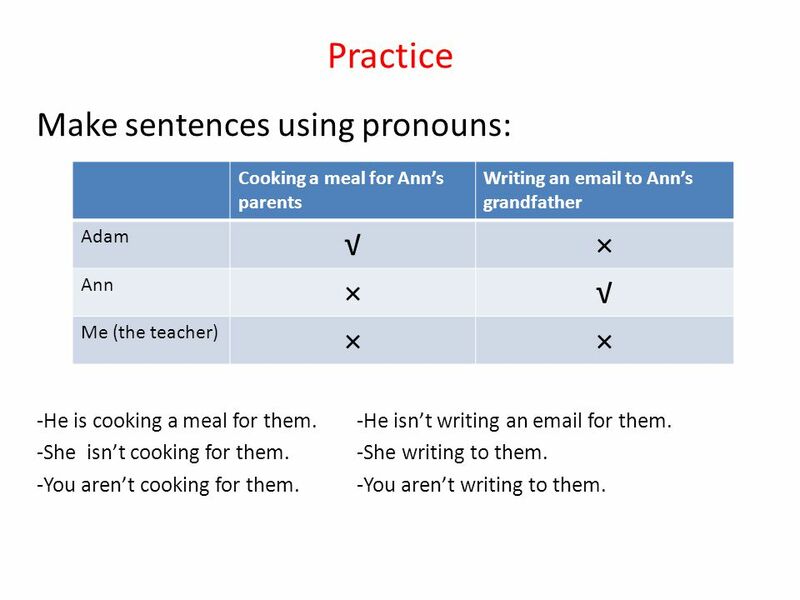 Pronouns Takes the place of a noun, and makes the sentence less repetitive or cumbersome. Pronouns – Part One Grade Eight. WeWe Us He I She Pronouns A pronoun is a word used instead of a noun or another pronoun.  A pronoun is a word that takes the place of one or more nouns or pronouns.  The word that the pronoun refers to is called the antecedent.  There are. Pronouns: subjective, objective and possessive case. PRONOUNS!! A pronoun is a word used in place of a noun or another pronoun. A pronoun is a word used in place of one or more nouns. Zac Lawrence Taylor Crowder. 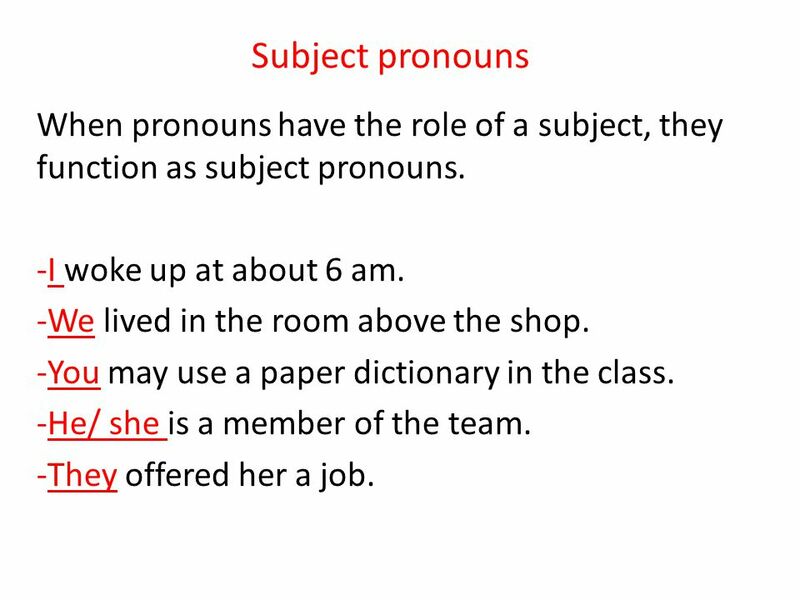 Unit 4 Week 2 Introducing Kinds of Pronouns. 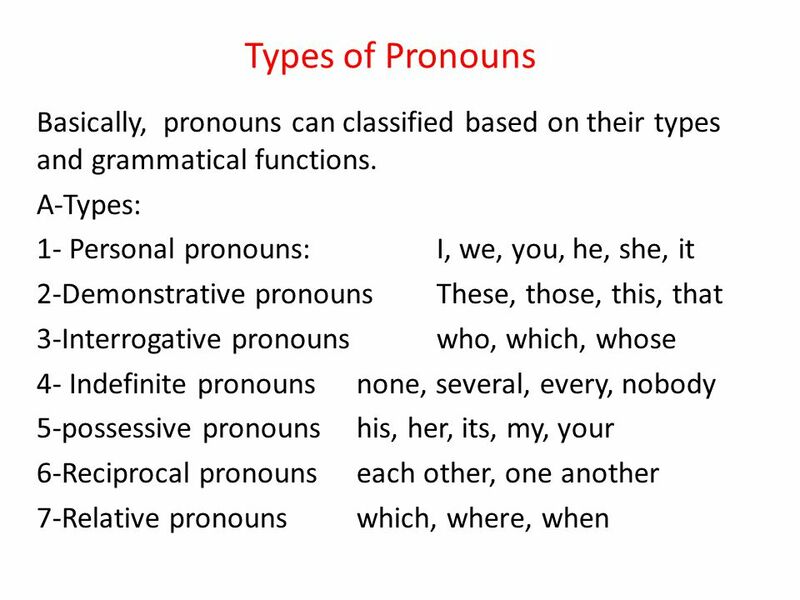 Kinds of Pronouns.